Giving Day 2019 – "One Day for UK"
LEXINGTON, Ky. (March 19, 2019) — One day. One gift. Enormous impact. Mark your calendars! On April 17, the University of Kentucky will rally alumni, faculty, staff, parents, students and fans to support the campus community through "One Day for UK." During the 24-hour campaign, donors are encouraged to support the college, unit or cause of their choice. "At the University of Kentucky, we are harnessing our dogged determination and boundless compassion to do more — and be more — for the state we serve. 'One Day for UK' is an opportunity to join together and follow in the footsteps of those who came before us, those who gave of themselves to change our campus and Commonwealth for the better. Together, we can write the next chapter for our institution; together, we will show the world what Kentucky can do," President Eli Capilouto said. "One Day for UK" also supports the university’s comprehensive campaign, Kentucky Can: The 21st Century Campaign, which increases opportunities for student success, funds innovative research, improves health care, strengthens the alumni network and enhances athletic programs. Now, more than halfway to its $2.1 billion goal, Kentucky Can benefits from every gift. 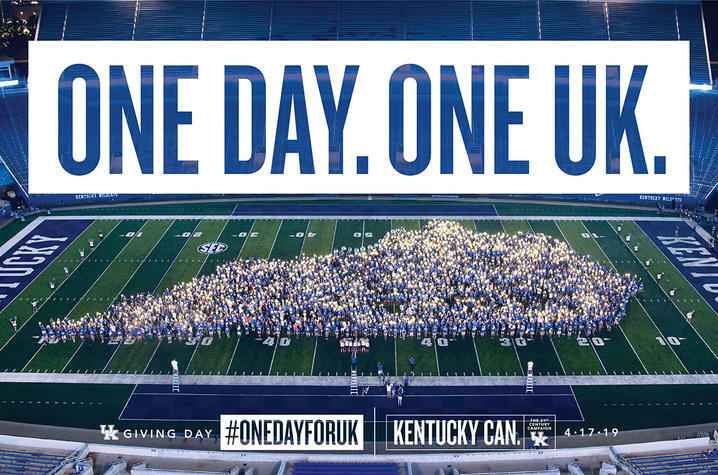 To further promote the day, each college, unit and cause is seeking ambassadors — students, alumni, friends and donors — to help publicize "One Day for UK" through their personal social media accounts. Each ambassador will receive a toolkit with language and strategies to help them spread the message. Most colleges, units and causes have selected a specific fund or funds to highlight on "One Day for UK." A complete list is located online. Donors can make a gift by sending a check in the mail or by visiting Network for Good before April 17. Simply check a box to have your gift applied to the overall total. On April 17, visit the "One Day for UK" website to make a gift, track the progress and learn how the campaign benefits UK. To join the online conversation, follow #OneDayforUK on all social media platforms.